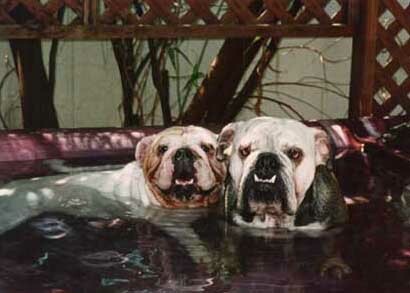 Ike and Sandy were two bulldogs that lived with my daughter Tracy and her family in Chandler, AZ. Ike was a happy dog who loved playing with children, but he also enjoyed his quiet time, so Tracy had a large dog house built in the back yard should Ike chose to get away from it all. Sandy was Ike's BFF. They were from the same litter and spent all of their days together, so when Sandy died in 2008, at age 10, the family thought Ike would cross over too. But Ike grew older and still seemed to have the will to live. 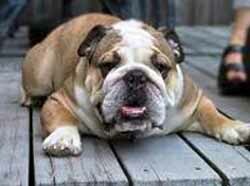 After Sandy died, the family bought another small dog to keep Ike company, but Ike wasn't that interested. He preferred to spend his retirement years peacefully in Arizona without a live-in companion just as many humans do. Thursday June 23, 2011 -- Tracy sent this email: "Ike died last night of old age. He was 13 years and 1 month old. We will miss him very much." Good-bye Ike! As with all things, this chapter of the story is ending. It is not easy to lose a beloved pet, but the experience also allows us to find out how we can telepathically communicate - Dog Whisperer. You too can learn to do connect in today's higher frequencies of consciousness. I'm posting about Ike because I recently blogged about a large number of pets and other animals crossing over now, some from old age, others due to Earth's many natural disasters and other mishaps. Everyone is feeling the stress of living on planet Earth. You probably are too.